Sometime around July 21 last year US film Bloggers started receiving mysterious packages that included 2 coins. Arcade coins to be exact, with the words "FLYNN’s ARCADE" printed on the one side and "Home of Tron" on the other. OK! So Flynn's Arcade was the the games arcade that Kevin Flynn owned (played and created games in) in the 1982 film Tron. Turns out that this was the first step in an immersive viral campaign that involved cryptic code puzzles leading to www.flynnlives.com. The site outlined a short bio of Kevin Flynn and a history of the Flynn movement. This can be found here www.flynnlives.com/default.htm The site also had a countdown and further cryptic clues that led to a real world search and ended with the convergence of fans and bloggers at Flynn's Arcade in San Diego. As well as appearances by Garrett Hedlund the actor who plays the son of Flynn and Milo Ventimiglia (Peter Petrelli from Heroes). Pretty damn spectacular!! The flip side of the coin (Home of Tron) led to http://www.homeoftron.com/ which has some background to Flynn's arcade, Space Paranoid his most popular game and his disappearance. OK! So this week US Bloggers again started receiving packages with clues tying into the newly revised http://flynnlives.com/ZeroHour website. The top of the website is a cryptic countdown, which has been calculated to end at 8am(PST) Wednesday 24, 2010 which is 4pm over here in London and one day before Disney's Alice in Wonderland World Premiere. The bottom part of the page started out as a unintelligible code and has slowly evolved into the names of 25 Cities. London being the last on the list and the reason you are reading this. Sydney, Denver, Madrid, Paris, Boston, Washington DC, Orlando, Atlanta, Raleigh, San Diego, New York, Philadelphia, Toronto, Austin, Minneapolis, Nashville, Chicago, Salt Lake City, Los Angeles, San Francisco, Portland, Seattle, Las Vegas, Phoenix, London. - The release of the first official Tron Legacy Trailer (clips seen so far have been VFX test Footage) in 2D prior to a 3D version at the Alice in Wonderland Premiere the following day. 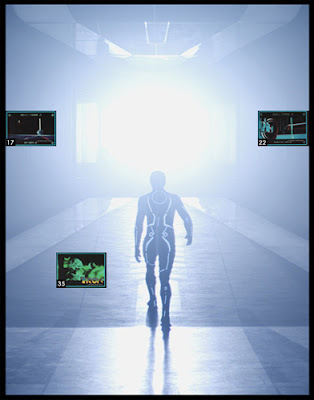 - The start to a scavenger hunt to a location of a Tron event similar to The Dark Knight viral last year. It would be great to hear your comments or touch base with a view to possibly banding together if there is a scavenger hunt. Update 1 - 24 February: theestablishingshot.com received an email this morning confirming that a Tron Legacy event will be taking place today and 25 people are needed. The Flynn Lives website is about to launch private Member Profile pages to better organize our group. If you haven't already, click here to set up your username and password. Sweeeeet! Looks like there is going to be a Tron based scavenger hunt. I'm hoping that it ends at at a Flynn’s Arcade with a Light cycle. But who knows? Please get in touch/sign up if you would like to band together on this. At a minimum I think we'll be the first to see the first Tron Legacy Trailer. By my (unconfirmed) calculations we should be getting the next clue at 4:00pm today at http://www.flynnlives.com/zerohour/. Red 5 in Selfridges, Oxford Street London. Damn! That was a long way for me to trek in a short time. I knew that at least 1 other player @agentlex (an experienced ARG agent) was located half way there at Piccadilly Circus. However he was on foot whilst I was on my trusty steel steed cycle. I bombed it towards Oxford Street careful to abide to all street signs and rules. I stopped halfway through Soho and made a costly mistake. I tracked down the telephone number for Red 5 via the Selfridges national number found on their website using my iPhone. I asked the Red 5 staff to access the current situation in-store. They said they would have a look around and I should call back. 6:22pm - Once I was in sight of Oxford Street I called them back. Contact had already been made. The pickup was actually made by @sowasred2012 . I had been beaten , glory and all the good stuff to follow were @sowasred2012's. Once I got back to MI9 I discovered that the winning operatives each received a mobile phone and a number to call. Once they called the number they were directed to a second location where they could find a Tron branded wallet within the wallet they found; 3 vintage Tron cards with codes on them, 2 hardcopies of the newspaper articles from Flynn lives site and two of the much sought after Flynn's Arcade tokens. Pics can be seen here! 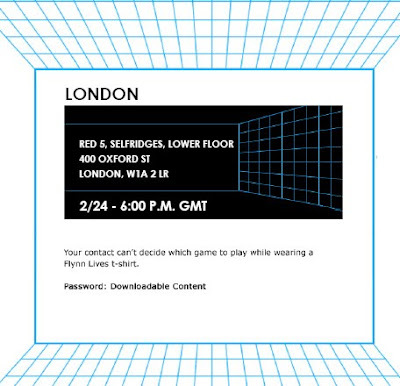 Once the codes were entered on the Zerohour website a previously blank square revealed a mini 80s Tron card. Flipping the card revealed that each square was part of a larger Tron image. Once all the codes had been entered and the full image revealed. More importantly the image was now hotlinked to >www.pitcell.com where it was revealed that an EXCLUSIVE LIMITED EVENT would take place at the IMAX in New York, Los Angeles London, Toronto and Sydney. What we know is that an event is taking place at the London IMAX on Saturday 27 February 1:30pm. Rumours are that it is a short preview of Tron Legacy, the first showing of the trailer maybe a Flynn's arcade re-creation. Tickets are to be available at 9:00pm London time. The IMAX schedule has not been disrupted and an Avatar screening starts at 2:30pm so any screening would be short and all over within an hour including arriving, collecting 3D Glasses and finding a seat. What we don't know is what the 66 global operatives are going to be doing, the significance of the arcade tokens or the other cryptic puzzles on the site like the activated flashing gif on the Flynn Lives site, the significance of the numbers on the Tron cards, or even if all the puzzle parts have been identified yet. All the tickets for all events are now gone and some further developments have taken place. The animated gif was blinking binary code, if you selected the corresponding numbers on the cards of the Zero Hour puzzle, the cards flipped over to reveal access to another web page - http://www.flynnlives.com/discussionforums/ an apparent forum run by friends, fans or employees of Kevin Flynn. Partially encrypted diagrams of a futuristic lightcycle. The number of possible clues and puzzles is melting my mind. Just found out this Encom site was found. This webpage was found on the Flynn Lives site. Looks like 5 sets of codes are needed. 5 IMAX events, 5 Codes? If you are going to the event s keep a look out for any clues.